Australia’s Optus has announced that it is the first Australian carrier to launch the new BlackBerry Torch 9800, available for purchase from today. Powered by the new BlackBerry 6 OS, the BlackBerry Torch is available to both businesses and consumers for $0 upfront on $79 pricing plans on a 24 month contract (minimum spend of $1896), with generous call, text and data value to enable customers to make the most of this exciting new smartphone. 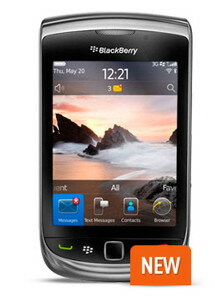 Small and Medium Business (SMB) customers can purchase the BlackBerry Torch on the $79 Business Complete Ultimate plan, which features $900 call and text value and unlimited BlackBerry POP3 email and web browsing via BlackBerry Browser plus 1GB additional mobile internet data. Business customers can also take advantage of unlimited BlackBerry Messenger, unlimited voicemail, unlimited SMS to Australian GSM mobiles and unlimited voice calls to services on the same account, all within Australia. For an extra $10 per month, business customers can also add a Business Advantage Business Mobile Broadband plan featuring a high-speed USB modem to receive an additional 500MB of data, with the ability to share the combined data allowances across their BlackBerry Torch and notebook or tablet. The BlackBerry Torch is also available to consumers for $0 upfront on the $79 Optus Cap plan, featuring the same included $900 call value and included mobile internet data as the Business Complete Ultimate plan, plus unlimited mobile access to social internet sites and unlimited SMS and MMS to Australian GSM mobiles. Those not familiar with the BlackBerry Torch 9800 phone should know that it comes with a 5MP autofocus camera with flash, 3.2-inch HVGA capacitive touchscreen display, optical trackpad, portrait-oriented slide-out QWERTY keypad, Wi-Fi b/g/n, 3G over HSPA, GPS, and more. 0 comments on "BlackBerry Torch 9800 lands on Optus in Australia"